Why Should You Choose Rosenello’s for Window Replacement? Rosenello’s Windows was founded by Mike Rosenello over 20 years ago, in growing the business from one person to over 15 full time employees & thousands of satisfied customers, Mike has found and incorporated a few core beliefs. 1. Solid values, hard work along with constant improvement is the nucleolus of any successful organization. 2. Knowledge on a subject allows for peace of mind in choosing a product. 3. Most customers are looking for quality products, professionally installed and at a fair price. In order to earn your business we’re going to supply you with an honest common sense understanding of both the industry and products. What to Expect When Replacing Windows? What style of window you are interested in having installed? Rosenello Windows can help you select a style of window that will match and compliment your home’s current aesthetic. If you have already looked at window samples, have you selected a brand or display that interests you? What is the time frame for your current window replacement or or home project? Who is the decision maker for your window project? Rosenello will consult with both the homeowner and any contractors or designers that are involved in your home improvement project. Are you interested in learning more about our financing services? The process of substituting all or most of your old windows with new replacement windows is one that homeowners go through more than once in their lifetime. Windows provide you with more than a view of the neighborhood. They are an important part of your homes’s protective envelope. Designed to let in light and air, they also hold the elements at bay. When a window begins to fail (to warp, rot, leak or simply refuse to open and close) the cost in terms of energy loss and aggravation quickly add up. We will help answer one of your biggest questions, how do you choose window replacements that will improve your home aesthetic and result in money saving reduced energy consumption. Rosenello Windows wants to be fully prepared to meet your needs and compliment your home improvement project vision. We will begin by gathering information and confirming an estimate. Next we will meet you in your home to discuss all the options available and present appropriate solutions. A home demonstration of our window products and a description of the remodeling process will allow you the opportunity to ask any questions you have about our products. Before we leave your home, we will have measurements and an agreed upon understanding of design choices, and you will have a written estimate. While new windows are no one’s favorite way to spend money without them you’ll eventually spend the equivalent in higher heating and cooling costs, and you’ll still have bad windows. The good news is that there are more choices in window replacement than ever before. Keep reading to learn more about our window replacement process, or contact Rosenello’s at 215-244-3993. Windows provide more than a view of the neighborhood: They’re really important parts of your home’s protective envelope. Designed to let in light and air, they also hold the elements at bay. When a window begins to fail (to warp, rot, leak or simply refuse to open and close) the costs in terms of both energy loss and aggravation quickly add up. Awning & Casement Windows: blend unique style and preferred operational function, whether you choose curved or fixed windows at the top and horizontal or crank windows on the bottom, you’re sure to love the many options available. Rosenello’s is a team of qualified window contractors. We work on window replacement projects and remodeling contracting. Often asked, what is the difference between new construction and replacement windows, homeowners benefit from understanding the window replacement process. New construction windows are designed for additions to current homes or for new structures. If a project involves major renovations that walls are being stripped down to the studs, then new construction windows should be considered when making design and product selections. New construction windows are manufactured in set sizes and are available in vinyl or wood. During the window replacement process, most, but not all, elements of an existing window are replaced. The existing window’s frame is retained, and the replacement window is fitted into this frame. Thus, the glass area of the replacement window will be slightly smaller than the existing window. The two most popular window replacement options are vinyl with sealed glass, which is the most cost efficient option, or wood replacement windows which are more expensive. Aluminum windows largely have become antiquated. Vinyl with sealed glass: The simplest replacements are 100% vinyl windows. During the process of installing vinyl replacement windows, you remove all but the external frame and have a complete replacement insert custom made to fit the opening. The replacement consists of an insulated vinyl casing with double-hung vinyl windows already installed. Vinyl windows are also available with low-E glass for reduced heat infiltration and an Energy Star Rating. Wooden replacements: Wooden replacement windows or sash kits, which often come with vinyl-clad external components are available. The vinyl exterior is rot-proof and never needs painting, while the interior components resemble a standard window. Sash kits come as an upper and lower sash with a balance system and fit in your existing frame. The wooden replacement windows are manufactured similar to vinyl windows and are a complete insert. You’ll pay more, but you’ll get a tight window with a conventional appearance. In most industries it is a common practice for companies to self label (i.e. Home depot, Sears) for exclusivity purposes and that makes it difficult to identify the actual manufacturer or model of your replacement windows. The uninformed consumer won’t find out if their purchase was a quality one or not for years after the purchase. In most industries it is a common practice for companies to self label (i.e. Home depot, Sears) for exclusivity purposes and that makes it difficult to identify the actual manufacturer or model of your replacement windows. The uninformed consumer won’t find out if their there purchase was a quality one or not for years after the purchase. Companies come in all sizes. When it comes replacement windows, the size of a company can provide you with important information about the quality of the product as well as engineering and design capabilities. A smaller company is not able to update technologies as easily as a large company would due to financial restrictions. A larger company is able to stay at the cutting edge of new technologies giving you the best possible product. The size of a company may also effect the manufacturing process. The smaller company could be at a disadvantage because they will have many more processes completed manually, but a larger company will have automated systems that have greater adherence to industry standards and less opportunity for human error. Rosenello works with the best manufacturers in the industry including Andersen, Trimline, Marvin, OKNA, Pella, and Semco. These outstanding companies offer solid construction and energy efficient technologies with every vinyl and wood window and door product. We will make sure that your replacement windows are high quality and provide a beautiful finished product. Check out our before and after case studies and projects. The materials and technologies that were used to design and engineer your window will effect its durability and functionality. The main frame, type of glass, glazing or coating material, gas filler and operation are all important to pay attention to when you are comparing windows and making purchasing decisions. 1. Structural Stability – The primary structural component of any window is the main frame. The structural stability of the window and its main frame will determine the longevity of the product and its ability to withstand natural hazards. The most destructive element is exposure to heat and cold, or expansion and contraction. Similar to sidewalks and roadways that suffer cracks and potholes, when the outside surface of your window is 10° and the inside surface is 70°, the forces of expansion and contraction can create a twisting force and weaken the window frame. Rosenello’s window main frame is engineered with temperature fluctuation in mind. Our frames are multi chambered and fusion welded to offer the best defense against the elements. Fusion welding assures lasting quality and performance. Low quality main frames will have less chambers and alternate joining methods. When you are selecting windows make sure you pay attention to the engineering of the main frame to ensure you have a durable product. 2. Operation – The operation type of a window will influence air leakage rates. Awnings and casements should be as airtight as possible once they are closed against the frame. Rosenello’s will share the advantages and disadvantages of various operation types before you make purchasing decisions. 3. Energy Efficient Insulated Glass Unit (IGU) – Rosenello’s uses advanced design and superior materials to produce replacement windows that offer outstanding energy savings and efficiency. An Insulated Glass Unit consists of three parts, the glass coatings, the gas filler, and the type of spacer, which all effect the rate of heat loss and ultimately, energy ratings. The National Fenestration Rating Council (NFRC) in conjunction with the US Department of Energy created tests to measure heat loss and performance. The NFRC-100 is the standard test for heat loss through a fenestration, or window product. Once these tests are complete window manufacturers will receive ratings. U-Value measures the rate of heat loss. When selecting a window you want to pay attention for low U-Value ratings because it will indicate that the product is better at resisting heat flow and has a greater insulating value. 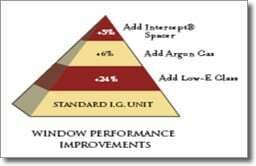 The following chart illustrates why a window made with Solarban 60 Low-E glass will thermally outperform windows with any of the lesser glass products. Solar Heat Gain Coefficient (SHCG) is a measure of how well a window product blocks heat caused by sunlight. 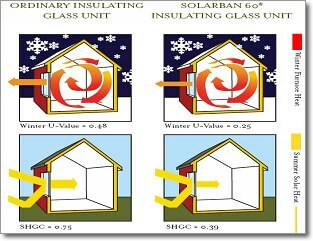 Again, you want to look for lower numbers which implies the window transmit less solar heat into the home. Rosenello’s strongly recommends the ClimaTech Insulated Glass Package for window and door products to ensure optimal energy efficiency. A window is 80% glass so it is not a surprise that substantial heating and cooling savings come from improved glass performance. ClimaTech Insulated Glass Units combine UV-filtering Low-E Glass, insulating argon gas and the Intercept™ Warm Edge Spacer System to create significant energy efficiency. Together they can cut the damaging effects of the sun and result in utility bill savings year round! In summer, ClimaTecha can reduce the SHCG by 48% reduction and help cut air conditioning costs. Argon gas filling, a better insulator than normal air, can increase energy efficiency by 6%. The thermographs to the left clearly show the effect that Low-E glass has when contained in an insulated glass unit. The window on the left is a clear insulated glass unit. 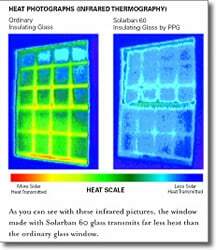 The heat transmittance, indicated by the green, yellow and orange colors from the heat scale, is far more apparent than that of the window containing the Solarban 60 Low-E insulated glass unit. The optional ClimaTech Insulated Glass Package combines PPG’s Solarban® 60 multi-layered Low-E Glass with the Intercept™ Warm Edge Spacer System and argon gas. The ClimaTech glass package is up to 40% more energy efficient than most other low-E or mid-E glass systems, and provides more than twice the energy efficiency of clear glass units. The chart to the left explains how the ClimaTech Insulated Glass Package will be far more energy efficient than a window with a clear glass unit. Image A. Low-E Glass filters long-wave radiation. This reduces the heat gain in your home from the sun in the summer, keeping your home cooler. Image B. Low-E Glass takes on a new duty in winter months. It lets warm solar rays into your home while blocking the heat in your home from getting out. Learn more about the Climatech™ Insulated Glass Package and choose the most energy efficient window product on the market today! Contact Rosenello’s for more information. Rosenello offers the best quality vinyl windows on the market. We work with manufacturers that offer well designed products that will last. Dual ventilator locks, a secure way to keep windows open for ventilation. Full of half fiberglass screens provide ventilation while keeping insects out. Rosenello’s delivers high performing energy efficient products for every single window replacement and installation. We also pay attention to aesthetics! Our windows offer a softer white as opposed to the starkness of our competitors. We have paid attention to design and included a beveled exterior frame. We use drop-in style window tracks to hide the glass spacer, an interior glazer on sashes to reduce the exposed seams and we always place screen splines to the inside of the window for a smooth, uninterrupted clear glass view. We offer a wide variety of window styles and all come with high performing insulated glass units. Rosenello’s knows that advanced design and superior materials will produce outstanding energy savings and trouble free operation. 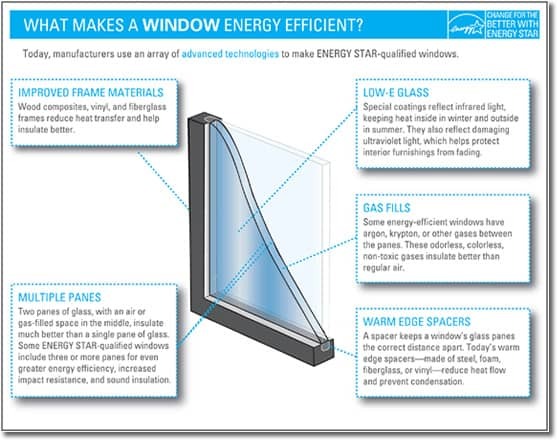 In addition to recommending specific products that we love and trust, we offer many tips to improve energy efficiency when you replace your windows. Vinyl frames and sashes will never chip, peel, crack or warp. Tough, solid virgin vinyl, with color formulated throughout so the beautiful luster lasts. Quad 4 weather-stripping at the header adds even more protection from the elements. Interlock at sash meeting rails creates a super-tight seal against air infiltration, providing security, comfort and well being. Rosenello’s Windows offers warranties on our window, siding and roofing products. You can trust us for quality service from consultation to installation to maintenance in the future.